Disabled veteran Tom Demers of Bangor. AUGUSTA — Fifteen disabled Maine veterans experienced a once-in-a-lifetime controlled moose hunt this year as participants in the annual Maine Disabled Veterans Controlled Moose Hunt, held in Aroostook County in August and September. Since 2010, the Maine Bureau of Veterans’ Services has partnered with the Maine Department of Inland Fisheries & Wildlife and Smoldering Lake Outfitters each year to give disabled Maine veterans a guided moose hunting experience, free of charge. The program is funded through the generosity of many donors and sponsors, including: L.L. Bean, Wireless Partners, American Veterans, Disabled American Veterans, and Safari Club International New England Chapter. • Thomas Funderburke, Greenfield Twp. 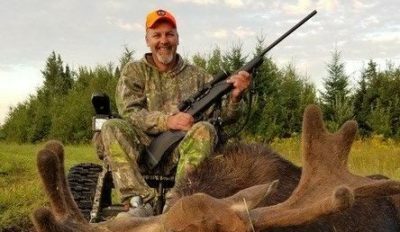 Unlike the regular IF&W moose lottery, the Disabled Veterans Controlled Moose Hunt lottery is limited to veterans who have a disability rating of at least 50 percent. Selected veterans are provided with hunting permits, experienced hunting guides, meat processing, travel & lodging, and essential equipment. If a veteran has ever tagged a moose through the program, that veteran is ineligible to hunt again. Applications for the 2019 program will be available on the Maine Bureau of Veterans’ Services website in March 2019. For more information on the Maine Bureau of Veterans’ Services and the Disabled Veterans Controlled Moose Hunt, please visit maine.gov/veterans or call (207) 430-6035.